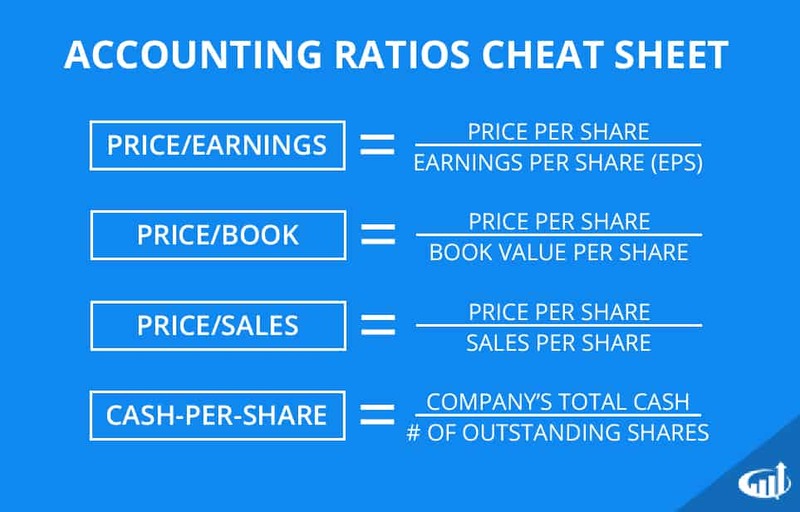 Accounting ratios are used to simplify financial statements, making it easier for traders to better understand a company's current standing. Price-Earnings ratio is arguably the most used ratio. It is derived from taking the price of the stock and dividing it by the latest earnings per share (EPS), thus P/E. The company needs to have profits in order to correctly calculate the P/E. The P/E can then be compared to peers within the sector or industry and general market to determine if the stock is under or overvalued. The same applies with comparing the other accounting ratios. Price-Book ratio is used to analyze the value of the company in relation to its intrinsic value. This is a useful ratio for companies that don’t generate a profit thus have no P/E ratio. The price is divided by book value to generate the P/B ratio. The P/B can be compared against sector and industry peers as well as the overall markets through a benchmark like the SPY exchange traded fund (ETF). Price-Sales ratio is used like the P/B making it especially useful for companies that don’t generate profits. The price of the stock divided by sales generates the P/S ratio. This can be compared to sector and industry peers to gauge if the valuation if particularly over or under-valued. Cash-Per-Share ratio is used to evaluate how much premium the market value the underlying business. It is derived from dividing the total cash by the outstanding shares. Value investors like to scan for companies trading under the CPS for potential cheap investments. However, it is important to be aware that very few companies trade under the CPS without some very ugly fundamentals.